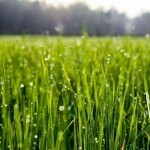 The lush, beautiful lawn you desire can be achieved through a variety of methods. Seeding and laying sod are two of the most common options, and if installed and cared for properly, either option can provide you with the lawn of your dreams. There are many differences between choosing to seed or lay sod, but the end result is usually the same, as well as the maintenance level after established. Establishing turf from seed requires less labor to install, but more care during the germination and establishment stages. The initial investment is less, because you are not paying for the 18-24 months farm labor to grown turf ready to cut for sod rolls. More selection of turf seed can be found than sod types. Faster installation than rolls of turf. Difficult areas can be successfully seeded. High quality seed will yield higher quality results. The amount of time accomplish the final result…a lawn you can use. Traffic should be kept completely off a seeded area until it is at least 2″ tall. Even then, it should be mainly undisturbed, since foot traffic, pets, etc., can easily destroy tender seedlings. Frequent watering during germination. The ground should be kept moist during the entire germination process. Seed cannot be planted all year long (sod can, if the ground isn’t frozen). It does not germinate below a certain temperature, and has a hard time germinating in the summer heat. Weed control during establishment stage is necessary. Erosion is more likely to happen to a seeded area vs. a sodded area. Even if it rains once during the germination process, the pattern can end up very patchy and may need to be over-seeded several times. Low quality seed will yield low quality results. Many seed mixes you find at a big box store are not even designed for the area you live in. These low quality mixes often contain weed seeds, have low germination rates, and could contain grasses that you do not want. Seeding rates may be difficult for the average person to calculate, and when incorrect can have a negative impact on seed germination. An NTEP rated variety, which means it has been independently evaluated and rated by the National Turf Evaluation Program, means these selected grass seeds have been specifically bred for superior green grass color, disease and insect resistance and drought tolerance. Use top quality seed. Ask about germination rates. Grade 1 is better than Grade 5. Using a spreader will ensure you get the proper coverage of seed. Too much coverage of seed can cause the seed to compete with each other. Too little and you will have bare spots. A spreader will work perfectly. Don’t seed in the hot summer months. Seeds have to compete with usual summer weeds, and do not germinate well in heat and inadequate moisture during the summer. Spring and fall are usually the best times to lay seed. Planting seed too deep will not allow it to germinate. Laying seed and covering with about 1/8th inch of topsoil is plenty to start germination. Can be walked on within days of planting. Great for sloped areas or erosion-prone areas where seed would have difficulty surviving. To establish you will need to use a larger volume of water than after established. Requires a lot of manual labor to install. Choose fresh, healthy sod. You don’t usually find quality sod in the big box stores. Proper soil preparation is one of the most important steps prior to sodding. The optimal soil will be a loamy mix, therefore clay type soils will need amendments such as compost and peat moss.